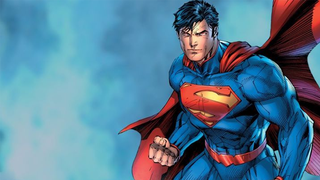 Over the years, Superman’s power-level has fluctuated rapidly, as writers have given and taken away some of the Man of Steel’s abilities in order to embolden or humanise him. But in this week’s Superman #40, Clark Kent underwent one change that brought him back to a level not seen in over 70 years. Warning: Minor spoilers for this week’s Superman #40 follow. You’ve been warned! In the past few months since Superman gained his “Super Flare” power — an ability that, at the cost of leaving him powerless for a day, lets him unleash all the solar energy in his body as a humongous energy blast — Clark has been shown as experimenting with his new power, and the relative freedom that comes with the periods of powerlessness that come with using it. Said superpower leaves Clark naked as the flare burns all of his clothes away, so to be fair, a great deal of that experimentation has left him hilariously naked a bunch of times, to boot. Comic books! That’s right. Superman can no longer fly. And Clark even thinks that it’s not going to change back in the foreseeable future. Instead, he just jumps really high! Before you start scratching your heads in confusion, this isn’t actually new; it’s actually reverting back to how Superman’s powers originally worked. When he first débuted in Action Comics #1 way back in 1938, Superman couldn’t fly at all — instead, he could jump the wonderfully specific height of 1/8th of a mile. His ability to fly would first appear in Superman cartoons and Radio plays, before he picked it up in the comics for the first time in 1941. So really, in one way, Superman is now closer to his original introduction than he has been in nearly 75 years. The more things change in comics, the more they stay the same, it seems!